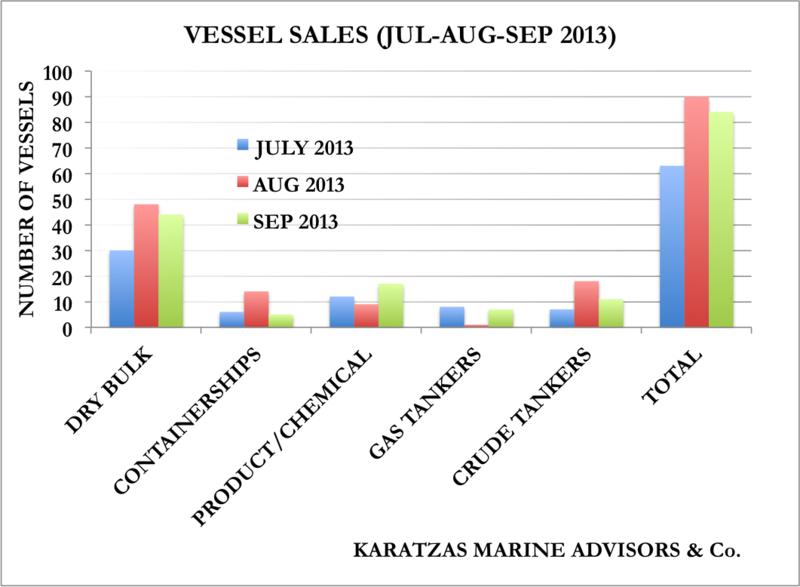 Please note that our latest sale & purchase report has been posted on our sistership website at Karatzas Shipbrokers Register on December 15th, 2013. Please follow this link for updated info! This entry was posted in Shipping Sale & Purchase (S&P) Review and tagged Basil M Karatzas, Karatzas Marine Advisors & Co. on December 17, 2013 by Karatzas Marine Advisors & Co.. 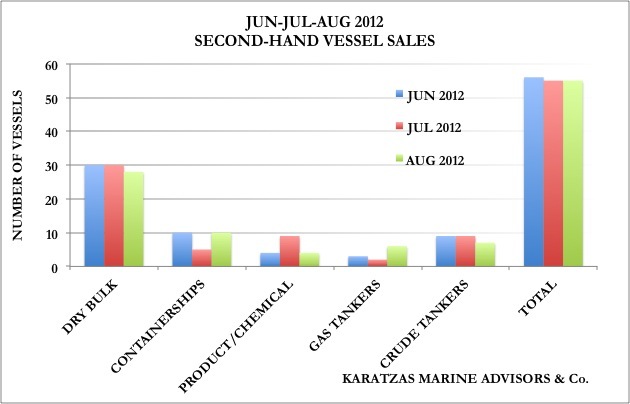 Please note that our latest sale & purchase report has been posted on our sistership website at Karatzas Shipbrokers Register on December 2nd, 2013. This entry was posted in Shipping Sale & Purchase (S&P) Review on December 3, 2013 by Karatzas Marine Advisors & Co..
September is always an interesting month, not because of the nostalgic memories of the beach and the summer vacation but mainly because it sets the tone for the all important final quarter of the year, the momentum and the expected deal volume to be closed by the end of the year. Freight rates in September were dominated by an exceptional increase for freight for capesize vessels caused by increased Chinese imports of iron ore. There have been a) no clear documentation yet as to the real cause (whether increased end demand for steel or more innocuously by stockpiling of steel plate or iron ore) and b) whether the trend is sustainable. 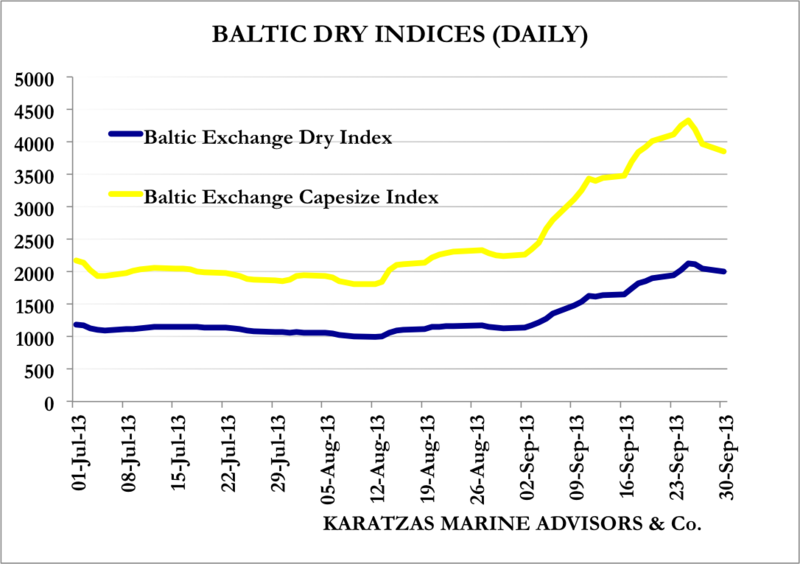 In a previous posting, we maintained a certain degree of skepticism on this market; however, despite the fact that cape rates increased and pulled upwards the overall dry bulk index (as per chart herebelow), panamax, supramax and handysize vessels didn’t share much of cascading benefit. 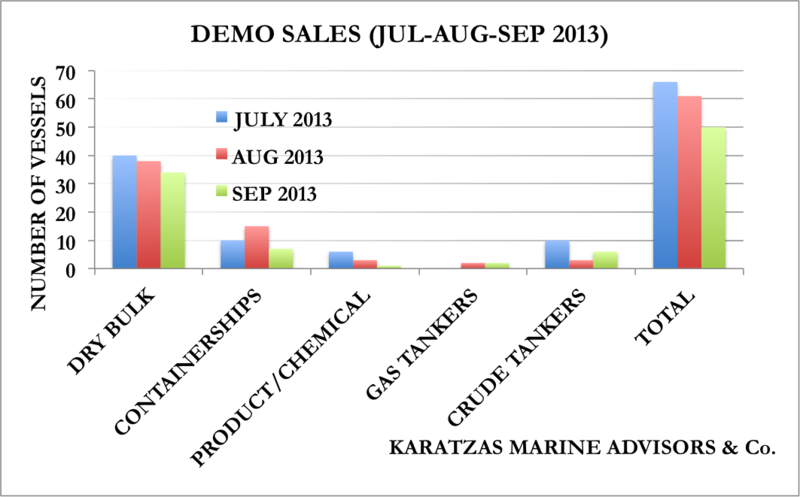 The tanker markets, whether crude or products and chemicals, had overall a very un-inspiring summer; clearly chemical tankers and products, especially for clean, performed better; gas tankers also have been showing a more animated performance. 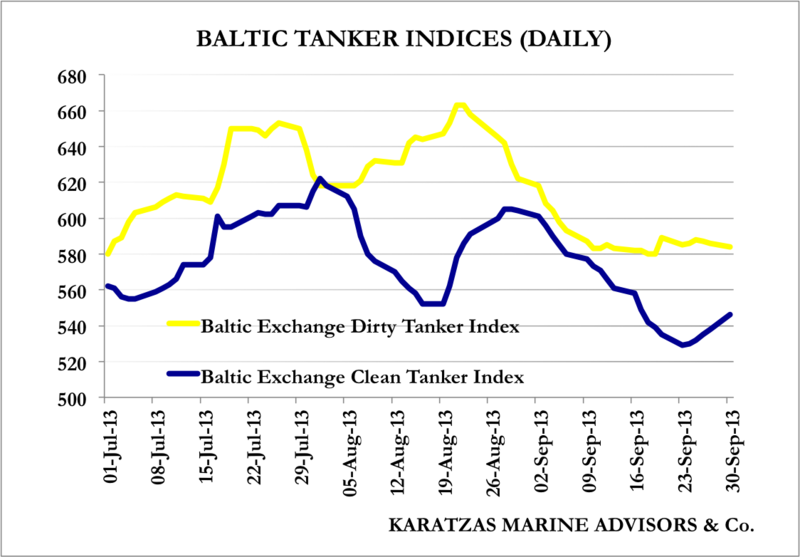 The chart herebelow with the two main Baltic Exchange tanker indices does not capture the whole picture, as crude oil tankers in certain markets, and especially VLCCs in particluar, are barely covering vessel daily operating expenses, again. Following on our last monthly report, we have incorporated data from the last three trailing months in 2013 for this end-of-September report, and also for the same timeframe of the last year, in order to give a better perspective; after all, comparing September volumes to August’s is not a fair argument due to seasonality. 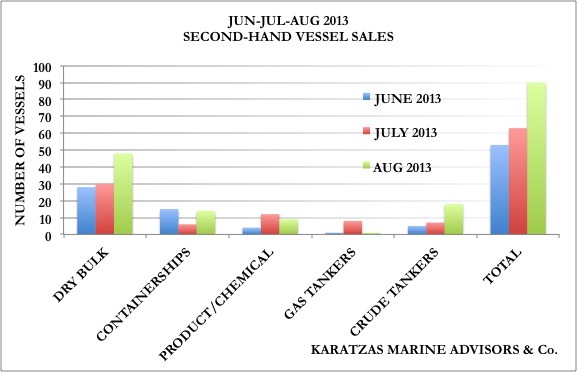 We have counted the sale of 84 vessels in the secondary market for dry bulk vessels, containerships, gas tankers, chemical and products, and crude tankers in September 2013. The volume is comparable to that in the previous month (Aug 2013: 90 sales) and also over the last year (Sep 2012: 80 sales.) However, August this year had been unusually busy (90 sales vs only 50 sales in Aug 2012), and the overall result has been that July-Aug-Sept in 2013 were busier for the secondary market with 237 sales vs. 190 sales in the same period last year. 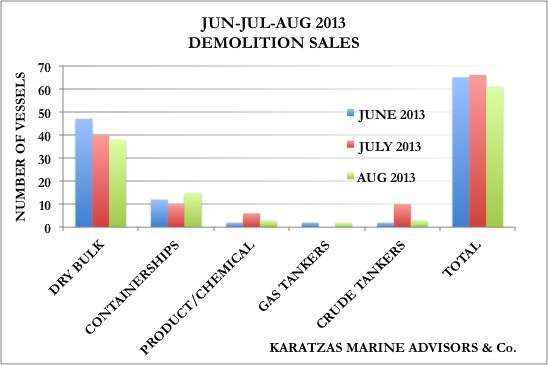 The demolition market for September has been fairly anemic with the sale of 50 vessels which is about 15% lower m-o-m. This is not breaking news, as the ‘de-coupling’ effect of the emerging markets from the Fed’s announcement of tapering off for bond buying had a major casualty in sub-continent currencies and especially for the Indian Rupee (INR), major currency in the demo market, which visited the lowest FX point in about fifteen years. The appointment of MIT-educated, University of Chicago professor Raghuram Rajan as the new Governor of the Reserve Bank of India and his prompt reaction of increasing interest rates as well as the Fed’s decision to temporize the tapering off of the quantitative easing (QE) has brought has stability in the markets and local currencies, and there have been some signs of market improvement by the end of the month. The de-coupling effect aside, the positive momentum in the freight markets has given second thoughts to many owners pondering whether they should be selling their vintage vessels for scrap. Scrapping prices have improved substantially over the month of September, primarily due to lack of demolition candidate vessels; there are concerns that there has been exuberant speculation in the market and higher expectations for defaults, as ‘cash buyers’ may be bidding up prices, but they are not the end buyers; they take market risk, and a great deal of them do not have the balance sheet to handle such risk, so caveat emptor. In general, scrap prices for tankers in sub-continent have nominally improved from $370/ldt to $420/ldt, an almost 15% increase in a short month, when there are no really assurances that the end market has improved equitably. The take home message from the demolition market is that in Jul-Aug-Sep 2013, 177 vessels were sold for scrap, vs. 235 vessels that were sold for scrap in the same period year, a decrease in scrapping volume by about 25%. A fairly substantial point, if one is ever to hope for market recovery caused by decreased tonnage capacity. 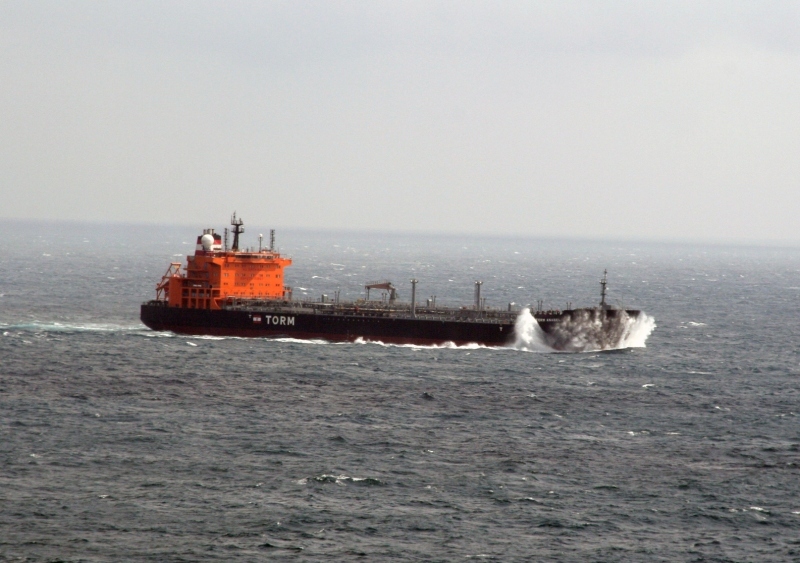 Further to the market recovery and tonnage capacity, 87 vessels were ordered in September 2013, almost identical amount compared to the month before, but almost 75% improvement y-o-y (50 orders in September 2012.) 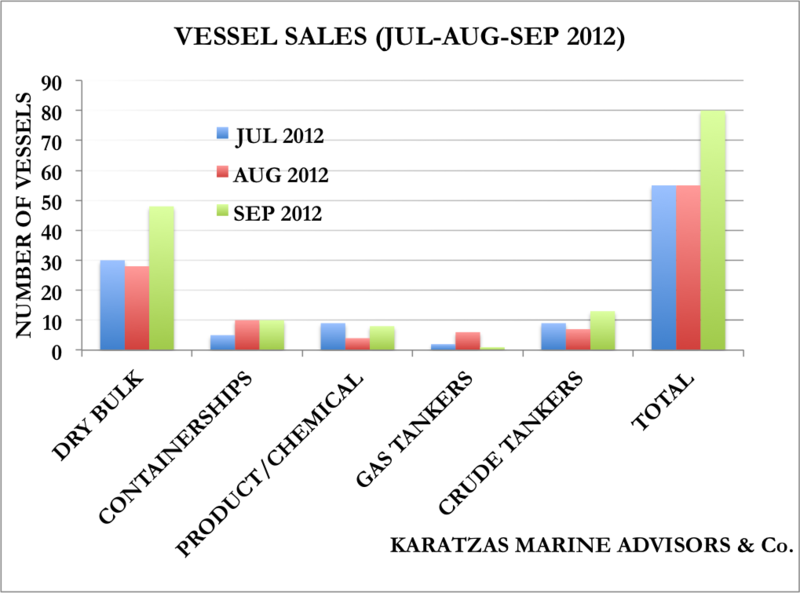 All in all, in Jul-Aug-Sep 2013, 272 vessels were ordered versus 170 vessels in the same period last year, an improvement of 60%; in terms of net numbers, one hundred more vessels were ordered during than demolished during this period, a monthly average addition of thirty vessels to the world fleet. Where is that damn market recovery? This entry was posted in Shipping Sale & Purchase (S&P) Review and tagged A.P. Møller Maersk, Baltic Dry Index (BDI), Basil Karatzas, demolition, Karatzas Marine Advisors & Co. on October 6, 2013 by Karatzas Marine Advisors & Co.. 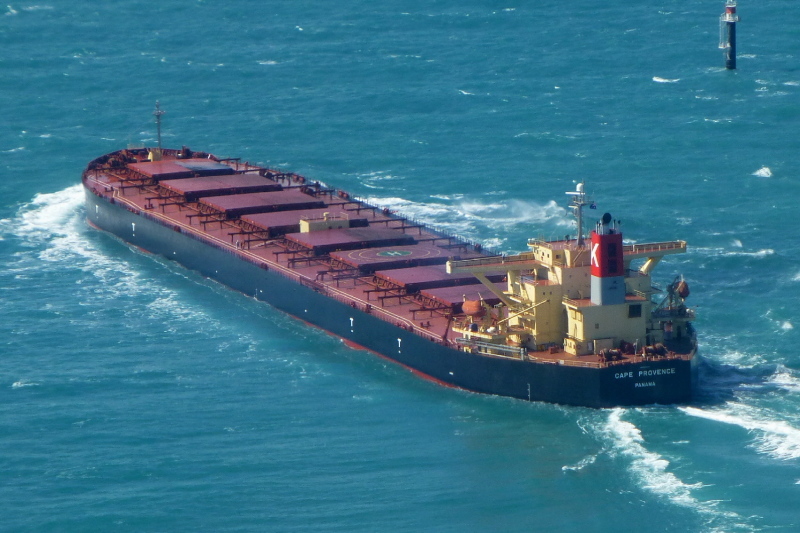 The capesize market had a terrific last two months with freight rates briefly passing $40,000 pd recently for an eye-catching improvement of almost 300%. As phenomenal such rates as they may be, one may even call them a ‘fantastic object’ as legendary investor George Soros might say about a situation like this, unreal but immensely attractive; besides the obvious question on whether the freight rally is sustainable, there have been anxious inquiries on the impact of the rally on asset pricing, especially for modern capesize vessels. These two sales indicate substantial improvement for modern cape pricing over the last few months based on a market comparison analysis. About a month ago, Belgium-based Bocimar sold their 2012-built by Hanjin Subic in the Philippines MV „BULK CANADA” at $41.5 million to Norway’s Berge Bulk; given the perceived ‘weak’ name of the shipbuilder in the marketplace, some discount is attributable to such fact. Shortly before that, in late July, Jinhai Heavy Industries-built / controlled 179,000-dwt Hull No J0021 with 2013 expected delivery was sold at a reported price of $38 million to reportedly Greek interests (possibly, Marmaras Navigation.) This vessel had been ordered in 2010, based on information from market reports at the time, on behalf of Fredriksen’s Golden Ocean concern with an expected April 2012 delivery, but accurate details of full-fledged newbuilding contract details, such as refund guarantees, down payment, etc are thin at least. In any event, both these older sales deserve a downward adjustment of a couple of millions due to their shipbuilding pedigree and the potential lack of any extra TLC provided during their construction; and, both of the current sales came from high quality yards and seem to be of good specification, at least of specification not seeing in the market that often from sale candidates. 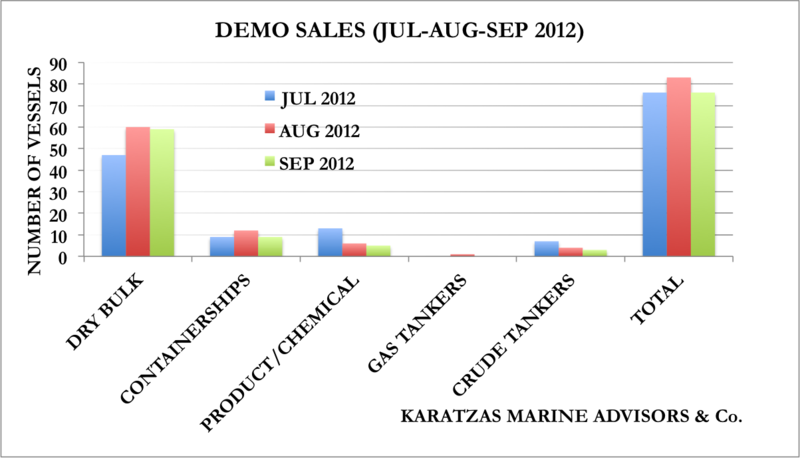 Based on these sales, there has been an asset appreciation in play to the tune of probably more than 25% over the last two months (when adjusting for age, spec, quality of parties involved, reputation of shipbuilders, etc) No bad for two months’ time, especially after the misery of the markets in 1H2013; and, again, freight improved by ten times as much in almost the same interval. Based on our discussions with market players, we understand that several modern capesize owners were approached about the possibility of selling vessels, providing another sign that the sentiment, at least temporarily, has improved and underlying the ever stated argument that there are no good vessels for sale. It will be interesting seeing how the market will develop, and whether the present developments in the cape S&P market are indeed signs of a cyclical recovery or just another ‘false positive’ temporary peak. At least for the immediate future, the market is widely expected to take a breather with Golden Week underway in China – the mother of the cape market; also, the paper market (FFAs) have not softened in the last two weeks despite the improvement of the spot market (CAL 14, CAL 15 and CAL 16 trade at about $17,000 pd,) well below the spot market, although the paper markets in shipping often trade in backwardation. And the drop over the last two weeks for HRC steel has dropped by $20/ton squeezing the margins for the steel mills. This entry was posted in Shipping Sale & Purchase (S&P) Review and tagged Basil M Karatzas, capesize vessel, Diana Shipping, Fredriksen, Golden Ocean, Karatzas Marine Advisors & Co., Marmaras Navigation, Sale & Purchase (S&P) on October 1, 2013 by Karatzas Marine Advisors & Co..
Summers are usually the season of the year to be leisurely enjoyed at the beach and under the sun, especially for those in shipping who during the rest of the year are trying to make a living from an office far from the sea and the ‘subject matter’ of their trade. Business in shipping, like in many other industries, during the summer usually slows down meaningfully reflecting the people ‘missed in leisure’ and also the fact that people staying back in the office are either too junior to originate a position or otherwise opt not ‘rock the boat’ in any way at such time, unless it’s a real boat at the beach. Sometimes however the boat rocks itself in the middle of the summer for the reason that no seasoned hands are at the helm when a wave breaks and light trading volumes amplify any market movements. In finance, it’s called the ‘summer curse’ as many ‘tragedies’ gestated or came to full fruition during summertime, from the blow up of the mega hedge fund Long-Term Capital Management (LTCM) and the related Russian and financial crises in the summer of 1998, to the mortgage securities and money markets freeze in the summer of 2007 which was the ‘dress rehearsal’ for Fannie Mae’s tremble in the summer of 2008 that precipitated the collapse of Lehman brothers in early September in the same year. We do not wish to be reminders of bad events that took place in the past. Far from us such intent. 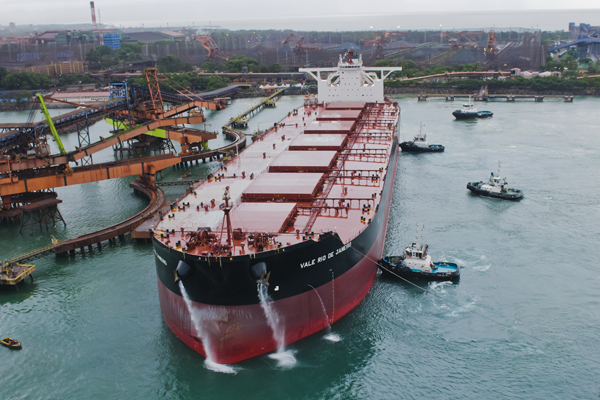 As one may suspect, the dry bulk market has been the most active with about 50% market share both for the summer of 2012 and 2013; however, in a surprising turn, August 2013 has been a very active month with twice as much volume as in June or July 2013. 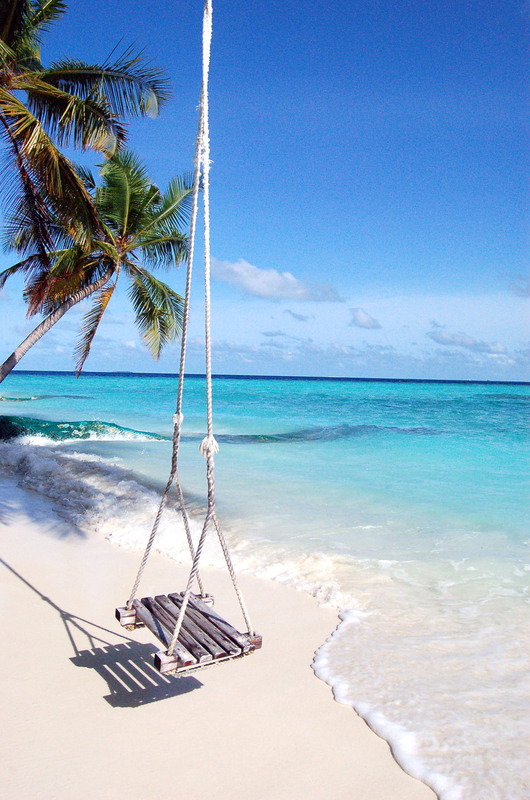 Obviously some buyers were not very diligent about enjoying their vacation time! 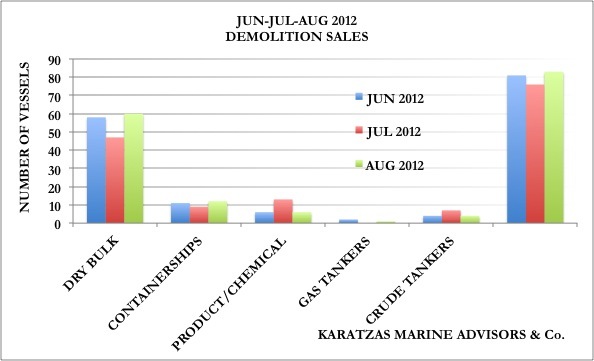 In the demolition market, on average 60 vessels (from the categories outlined above) for each of the three months were sold for demolition. 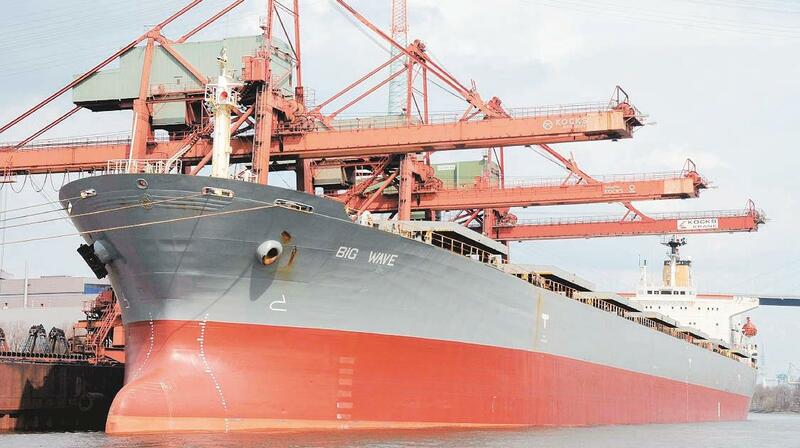 Again, dry bulk vessels have been domineering the market with about 65% market share. We suspect that some of demolition sales reported in August 2013 may yet have to reflect the full reality of the market, the precipitous drop of the Indian Rupee (due to ‘de-coupling’ of the emerging markets and the concerns about India’s growing deficit). 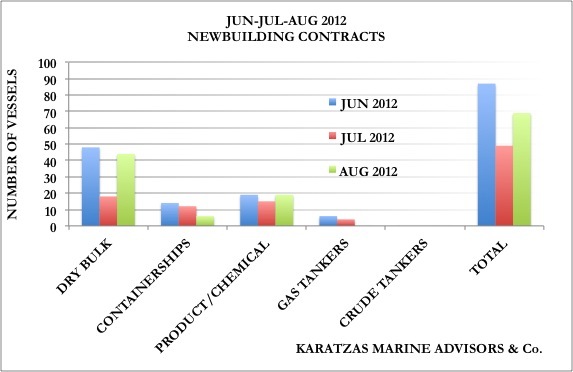 The summer of 2012 had been busier in terms of demolition as about 20% more vessels were scrapped then than same period this year. This may be explained by the fact that freight rates this summer have been holding better than last year, especially for bulkers, and also, last summer, besides strikes and labor issues at the breakers’ yards, ‘the coast was clear’ from major problems like drastic currency fluctuations. 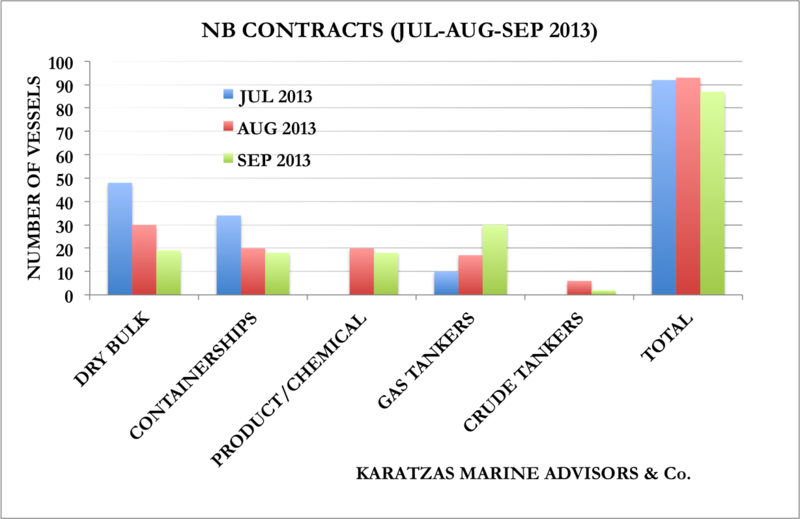 However, if the summer of 2013 was exceptionally good in any particular sector, that sector has to be newbuildings, as per graph above. 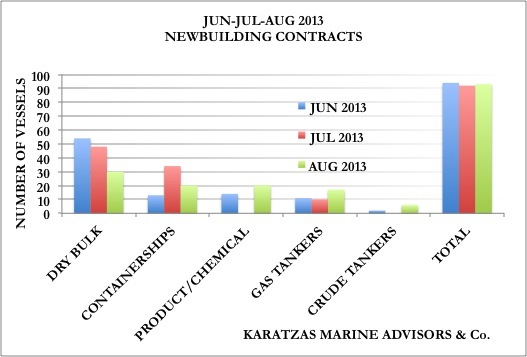 About 280 newbuilding contracts were reportedly signed in these three months, 100 more vessels than the vessels scrapped in the same period. In a nutshell, three vessels per diem were contracted to enter the world fleet in the last three months than were exiting the market through scrapping. Has anyone mentioned that there is shipping crisis? One would never know from the pace of newbuildings! 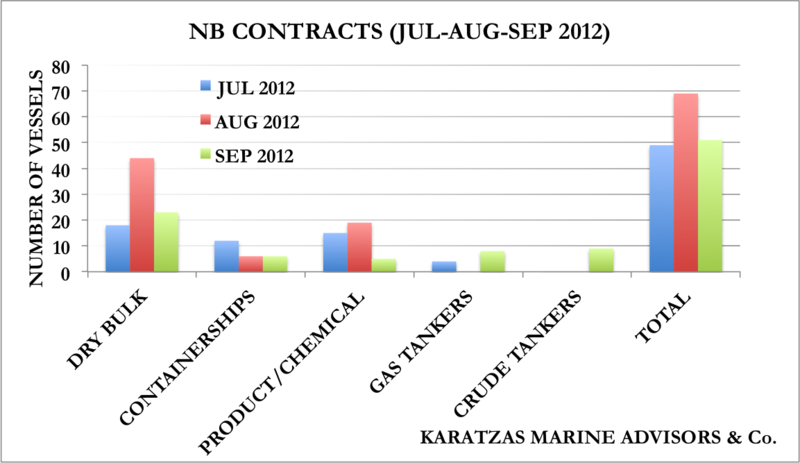 The summer of 2012 was not exactly dead quiet on newbuildings, but at least in the summer of last year, about 50 vessels, on a net basis, left the world fleet than were contracted as newbuildings. If there is a ray of hope in terms of newbuilding enthusiasm, one may find solace that about 40 gas carriers were ordered in the summer of 2013, versus ten such tankers in the same period last year. Gas carriers overall seem as the most balanced market sector so far in terms of tonnage capacity and demand, and the sector looks better prepared to absorb such tonnage compared to any other sector. This entry was posted in Shipping Sale & Purchase (S&P) Review and tagged Basil M Karatzas, chemical and product tankers, containerships, crude oil tankers, demolition, dry bulk, gas tankers, Karatzas Marine Advisors & Co., newbuilding contracts, Sale & Purchase (S&P), scrapping, tonnage capacity, tonnage oversupply on September 3, 2013 by Karatzas Marine Advisors & Co..